Choosing a putter? Make sure you read this first! Choosing a putter that fits your game is the most overlooked, but most crucial thing you can do to lower your score. It's crucial to get it right. The following tips make it easier to select the right club for you and save the irritation of bad putting! 1. Select the putter balance that fits your stroke... Disregard the rest! (In my view this is the most important secret in choosing a putter): Putters are weighted differently to suit different types of stroke. If you have a conventional open-square-closed stroke (like Tiger Woods, Phil Mickleson and 95% of tour pros), then you should be choosing a putter which is toe weighted. 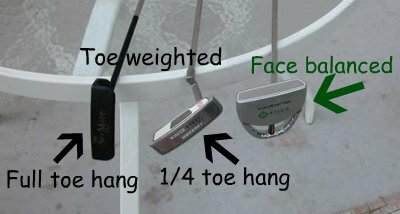 If, on the other hand you are trying to achieve a straight back and straight through stroke (like Padraig Harrington) the best style of putter for you will be a face-balanced putter (see image). You can see what is meant by face balanced and toe weighted in the picture above. Imagine you had the putter balanced on your palm - or on a table like in the picture. If the face points up to the sky, parallel to the horizon, then it's a face balanced putter. If the toe settles lower than the rest of the putter then it's a toe-balanced or toe-hang putter. There are varying amounts of toe-hang. Most people describe the amount of toe hang by reference to a clock face. For example, the putter on the left in the picture hangs vertically, so that would be a 6 o'clock toe hang, which is quite rare. The putter in the middle is more typical of a toe hang putter - it falls at about 7:30 on the clock face. Scotty Cameron and some others describe this as a 1/4 toe hang. A face balanced putter is designed to stay as square to the putter path as possible through the stroke. 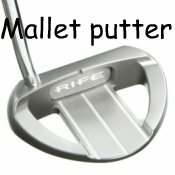 You would think therefore that everyone should be choosing a putter like this, but you'd be wrong. Most people putt with an open-square-closed stroke where the putter moves on a slight arc (sometimes known as an in-to-in stroke or a barn door stroke). This is the most natural way to putt and toe weighted putters are designed to work most effectively with this type of stroke. As I write this article 6 of the world's top 10 players use toe weighted putters and the remaining 4 are using a face balanced putter. Because the putter weightings are designed for these different styles of stroke, the last thing you want is a putter that's working against the shape of your stroke. When you're choosing a putter, weighting should be your first consideration. So make that decision now and you make the job of choosing a putter a whole lot easier by eliminating about half of the options. The Ping Anser putters of the 1960s popularized the heel and toe weighted (or "perimeter weighted") style of putter design. So called because they have their weight concentrated in the heel and toe areas, these putters have the largest sweetspots of any putters (the sweetspot is the area where true hits can be achieved). Heel and toe weighted putters have been shown to twist less than any other style of putter with an off centre hit. This means that the difference between where putts end up if struck by the sweetspot as compared with off-centre hits is as small as possible. This style is a favourite amongst purists for its traditional good looks. Because the shaft enters the head at the heel, this also moves the sweetspot towards the heel. Putting guru, Dave Pelz suggests therefore that people who tend to miss the sweetspot towards the heel of the face would be best off choosing a putter with a blade shape. Blade putters are heavily toe weighted (see explanation above), so are great for open-square-closed strokes and disastrous for straight-back, straight-through strokes. The weight in a mallet putter is distributed further towards the toe end of the face than in a blade putter and therefore this style will favour you if you tend to miss the sweetspot towards the toe end of the face. Depending on where the shaft enters the head, a mallet putter can be either face balanced or toe weighted. 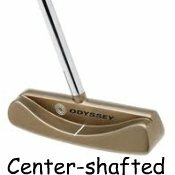 i) These come in two guises - Modern center-shafted putters which are almost always face balanced (see explanation above) are excellent if you're trying to produce a straight-back, straight-through stroke. ii) The "Bullseye" style of putter which was popular in the 1950s - 1980s. Although elegant, these brass putters have become much less popular due to tests proving that they have the smallest sweetspot of all putter designs. 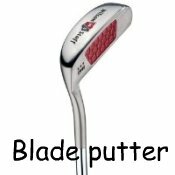 Choosing a putter like this can be disastrous if you're a beginner, as beginners miss the sweetspot more than more proficient players. The hottest things in putter design. Futuristic putters such as Scotty Cameron's Futura Putter come in all different shapes and sizes. Futuristic putters have been designed with function rather than appearance in mind and generally have large sweetspots. They are almost always face balanced and looking down at them takes some getting used to! Although there is a standard length for conventional putters (men's are 35 inches - 90cm, and women's are 33-34 inches - 84-86cm), don't be afraid of altering the length of your putter if you feel uncomfortable with it. Current theory amongst teaching professionals is that the more upright you stand when addressing your putts, the better visual perspective you have and therefore the better you can judge distance and break immediately before you take the putter back. This suggests that choosing a putter with a longer shaft will make you a more effective putter. However there are people who advocate using a shorter putter. They say it increases feel, especially on very fast greens. Light putters are generally thought to be easier to putt well with on fast greens and heavy putters are usually more successful on slower greens. Relatively recently a line of extremely heavy putters, have appeared on the market. Their major selling point is the stability of the putter through impact. As yet I have not had a chance to try or review a heavy putter, but if you don't get on with standard weight putters, you might want to check it out by clicking here. Putters aren't generally available in the same wide range of lie options as irons. This makes choosing a putter to fit your body shape and address position difficult unless you know a good clubfitter. Finding a putter that lies correctly - i.e. so that the sole of the putter sits flat on the ground when you address the ball is generally considered to be fairly important. Therefore the taller you are, the more upright your putter will need to be and the shorter you are the flatter your putter's lie angle can be. However, unlike iron clubs which your local pro or golf outlet can alter relatively easily, you can't get a putter easily adapted to suit you. In order to alter the lie angle of a putter your club pro will need a type of vice and only high quality club fitters have them. Unless you know of a very good club fitter near you, your best bet will probably be to send the putter back to the manufacturer (especially if it's an expensive one) so they can custom fit it for you. Even though it's time consuming to send it away, don't risk any "home improvements" to alter the lie of your putter (I speak from experience here!). The Reason? You will almost certainly bend the putter in more than one direction (or plane) - in other words, you'll probably add or take loft off the putter by bending your putter yourself, and that can spell absolute disaster for the roll your putter puts on the ball. Technicians and putter makers have spent countless hours working out whether to put 4 degrees of loft or 2.5 degrees onto your putter to make it roll the ball best - a careless nudge or hammer blow to your putter when it's clamped in a vice could change that from 3.5 to 6 degrees and you'll be putting with a chipper! Whatever you do, leave it to the professionals - in this case, the putter manufacturer. There really is no substitute to giving a selection of putters a try. 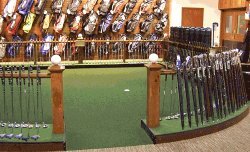 A lot of golf shops have now installed astro turf putting greens in their shops to help you in choosing a putter, but in my experience, these are NOT the best places to try them out. Make sure you get onto a proper putting green when choosing a putter. A good way to try out a putter is to try out your playing partners' putters while playing a round. This way you can try two or three putters a round on real greens... then you can come straight back to Best-Putter.com to find the best new and used prices!